I like Bundts because they don't have a lot of frosting and I am not much of a frosting person. Your beautiful Bundt looks and sounds delightful. Such a perfect treat! That caramel frosting looks rich and delicious - what a tasty way to top off this delicious cake. Yeah....I'm not a frosting lover but that caramel glaze was awesome. Pear butter, that is making me drool thinking about it. I love your bundt, so gorgeous!! Oh my gosh this sounds heavenly! I am soooo jealous of your fruit tree bounty, and can certainly understand why you'd miss those trees so much! I used to make my own apple butter, but never tried pear butter. That sounds great too! YUM! yes, I'm anxious to plant more trees but know that it will be a few years before we reap any bounty. Love that icing! And what a sink full of fruit! I had a lot of pears a couple years ago and made a ton of peach-pear butter. Just a bargain haul from the produce market as I don't have a tree. Sadly, I don't either anymore but I am changing that in the Spring. Wow Wendy, that is a lot of pears, I do envy you, looks so wonderful! 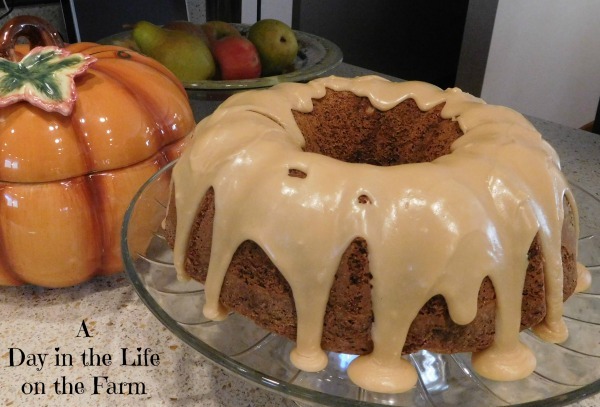 The bundt cake looks amazing, and the icing... mmmm! WHOA THAT'S A LOT OF PEARS! I do hope you're able to have just as successful bounty in your new home soon. Thanks for baking with me! Have a wonderful Thanksgiving, Wendy. Thanks Lauren and hoping you and yours enjoy your first Thanksgiving in your new home. 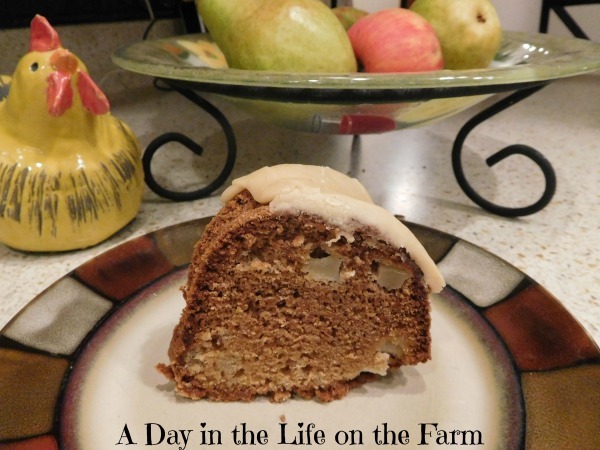 Your homemade pear butter sounds amazing, and what a wonderful addition to your cake. It looks delicious. I can't imagine having that many pears to deal with! I'd be making pear everything! Your cake looks and sounds lovely!